To talk of Chinese Green teas is to talk of Longjing Tea! 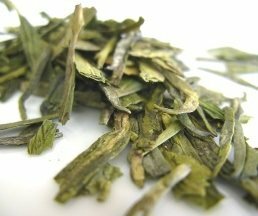 This is a wonderful tea that is world famous for its high quality, its unique flat leaf shape and a brew that is unlike any other green tea. It is the perfect beverage if you are an experienced tea drinker or if you are taking your first steps in the world of Chinese green teas. Come and learn how to make the perfect cup of Longjing and at the same time take a moment to understand a bit of its history. This combination of great flavor with green tea antioxidants certainly deserves the spotlight in your tea collection. Grown near the city of Hangzhou, in the Zhejiang Province of China, for more than a thousand years, Longjing has gained a great reputation for its exquisite quality. This green tea is indeed a world full of elegance, benefits and history, starting with its name. This Chinese tea is also known as Dragon Well tea, and there is more than one legend to explain this mysterious name. According to one version, in ancient times, people believed that a dragon lived in the village well, controlling the rainfall. They would actually visit the well and pray for rain. Another legend says that the name Longjing is both the name of a water spring and the name of a temple, where monks planted tea trees. Imagine starting your day drinking such an enchanting tea! Historically, Longjing green tea was not given its name until the southern Song Dynasty (960 – 1279AD), a dynasty that invested in the development of tea production. However, it was only during the Qing Dynasty (1616 – 1911AD) that Dragon Well tea was introduced to the world, due to the increasing interest of the emperor Qianlong (1735 – 1796AD), philosopher and poet, who loved to visit the tea plantations. During one of his visits to the tea plantations in Hangzhou, the emperor’s mother became ill, forcing him to return at once taking some tea leaves. Upon his arrival, his mother was intrigued by the smell of the tea leaves and the emperor brewed them for her. She soon improved and the emperor granted Imperial status to the temple tea trees. Longjing went from preferred beverage of emperors to tea offered still today to heads of state. To be an authentic Longjing green tea, this tea has to be produced in the right place, under the right conditions and using the right method. Take a minute to read about how this tea is processed and you will be able to tell a real Longjing from a fake one. Longjing green tea comes to life in the mountainous area of the Zhejiang Province, surrounded by a mild climate, rain and fog all year round. These conditions, and the lack of sun, allow the tea leaves to retain more theanine, thus providing your tea with a mellow and fruity taste. The best Longjing quality tea can be found in West Lake, namely in Lion Peak Mountain. There are, of course, other Longjing green teas produced outside West Lake, within the Zhejiang Province. 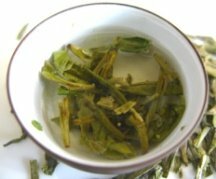 In other provinces, tea is being produced using the same Longjing techniques, but only tea produced in Zhejiang is considered real and authentic Longjing green tea. This tea is harvested in early spring and then only young buds are plucked. Leaves are jade-green in color. The highest quality teas are picked first, prior to April 5th, known as the pre-Qingming Festival. After that, teas picked are considered lower grades. Another step in the process that is unique to this tea is the roasting. This magical art is done by hand in iron pans. Roasters use their bare hands to better experience the heat and understand the development of the tea leaves, which takes up to five years to master. Longjing is a type of tea that is folded by hand into the shape of flattened sticks, much like a flat tea leaf. As this stage of the processing takes place a wonderful warm aroma emanates from the tea leaves. It is this technique that is often copied, so be careful when buying this tea. Make sure that all conditions are met so that you always purchase a real Longjing tea. Considering the different areas of cultivation, this tea offers you several varieties that range from superior, yet more expensive teas to lower grades that are more affordable and perfectly acceptable for beginners to experience this tea. Shi Feng Longjing tea – known as Lion Peak Longjing, the Shi Feng village was the original plantation area of West Lake Longjing tea. 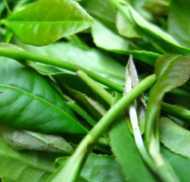 Today it is here that the highest quality Longjing tea is produced, a fresh tea with yellowish-green leaves. It is also the most expensive of all, but you would expect that of tea chosen for heads of state, wouldn’t you? Mei Jia Wu Longjing tea – this variety of West Lake Longjing tea is quite famous for its jade green color. It is produced in Mei Jian Wu village, in the Zhejiang Province and as a high quality green tea it is expensive, too. Xi Hu Longjing tea - this third variety of West Lake Longjing tea includes the tea plantations of the remaining villages in this region. It is the most famous variety. This is a high quality tea and therefore a bit expensive. Qian Tang Longjing tea – this tea is also produced in the Zhejiang province, just outside the West Lake area. It is a cheaper variety, as it is not from the Xi Hu plantations, thus more conservative masters would not consider this to be a true Longjing. Bai Longjing tea – you are moving further way from the original source of this green tea. This variety is produced in An Ji, in the Zhejiang Province. Though similar to Longjing in shape it is called a Bai Pian tea and it stands out for having a higher amount of amino acids than other green teas. With every variety you are going to get a great cup of tea that will do wonders for your mind and body. So come along and discover the green tea health benefits that you will enjoying. Such a special Chinese green tea is full of antioxidants, vitamin C and amino acids all working to improve your health every day with every cup you take. Longjing or Dragon Well tea may be a good choice to help you lose weight. It has one of the highest concentrations of green tea antioxidants, namely catechins, which combined with caffeine allow your metabolism to work faster. This combination will make you burn fat, build muscle and still feel healthy. Here's a tip: Try having a daily balanced diet, with a low sugar intake. 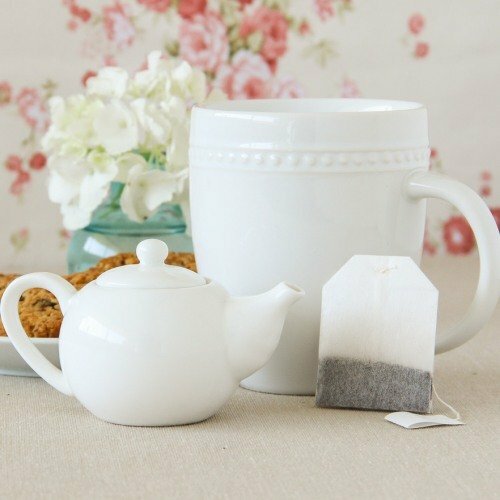 Take your time to drink your tea cups during the day, especially at meals and exercise your body regularly. Your green tea will work with you to achieve your weight goals. The great thing about tea is that despite its caffeine content, tea contains an important amino acid called L-Theanine that relaxes your mind. This combination will allow you to feel relaxed, calm and still remain alert and energetic during the day. Coffee alternative: Caffeine in tea isn’t that strong and it is released progressively, during approximately 6 to 8 hours, improving your concentration and alertness for your daily tasks. Green tea antioxidants, especially EGCG, have a double role with every cup of Longjing tea you drink. While you are fighting fat buildup, you are also preventing the development of tumors that may lead to cancer. This is a great tea to help you find protection from diseases, strengthening your immune system and creating the defenses you need to fight many diseases. Some of the most important diseases that you will be preventing on a daily basis with each cup of green tea you drink are heart related. If you are having trouble lowering your bad cholesterol and blood sugar levels, drinking tea should be the right choice for you. Longjing green tea antioxidants cleanse your blood from bad sugars; strengthen your circulatory system, unblocking blood vessels and reducing blood pressure. All this with a tasty drink, too. Don't fight the urge to smile! Help is on the way to make horrible dental plaque disappear. And with green tea, you will find that there are many reasons to smile. These green tea leaves contain fluoride and minerals that will help you fight dental plaque, tooth decay and bad breath! Your mouth may just be the symptom of bacterial infections or digestion problems, and with green tea you will heal both. So why not start right now? After meals, try rising with unsweetened tea and feel its freshness working. Have you ever asked why, when you feel low, a nice cup of tea always seems to lift your spirits and get you back on your feet? With so many great green tea health benefits, it is no wonder that the first thing anyone offers you is a hot cup of tea. Taste a green tea fit for an emperor! To truly savor this green tea experience you should prepare your tea correctly, so let’s learn how to brew Longjing tea. Traditionally, the best flavor will be achieved when brewing your Longjing tea using a Yixing clay teapot. You may consider purchasing one for all your green tea experiences. You may also want to try the more modern approach at brewing your tea. Using a porcelain gaywan is perfect, as the white porcelain lets you see the true color of your tea, or you may use a glass and enjoy the whole brewing process of leaves rising and falling. 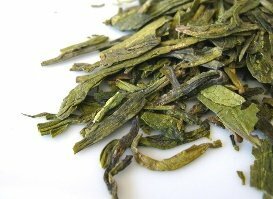 Here’s a tip: it is important to see the color of your tea liquor, because a high quality Longjing tea will give you a light green-colored liquor, whereas lower qualities will brew dark green teas. So choose a cup that allows you to test the first cup of your new tea. Start by selecting your water. Spring water will be the right choice for you, as it will avoid possible impurities and odd flavors. The ideal water temperature should be between 75ºC and 80ºC (167ºF and 176ºF). The higher the quality of your tea, the cooler the water and the shorter the brewing time. This avoids cooking the leaves and ruining the flavor of your Longjing. Next, place 3 grams of Longjing tea leaves per cup of water inside your cup or glass. Pour water carefully inside your cup or glass, so that leaves remain on top of the water. Incline your cup of glass and let the water flow down the side. Swirl your cup/glass gently around airing the tea. Finally, set your tea down and let it steep for 1-3 minutes as the tea leaves slowly open and fall to the bottom of your cup. It is for this moment that you may enjoy brewing your tea in a glass. Filter your tea and then drink while delighting yourself with its chestnut-like flavor and limpid, pale yellow color. Do not add sweeteners and enjoy the pure pleasure that is Longjing or Dragon Well tea. 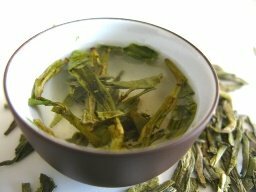 This green tea is great to drink with your meals, particularly with steamed dishes. So put away sodas and other sugary drinks and choose this tea for a better and healthier digestion. Embrace a healthier life and true moments of pleasure with Longjing tea! 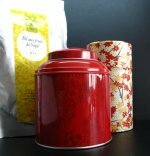 Click on the image or on the link below to purchase from Palais des Thés (US) your Longjing Tea. 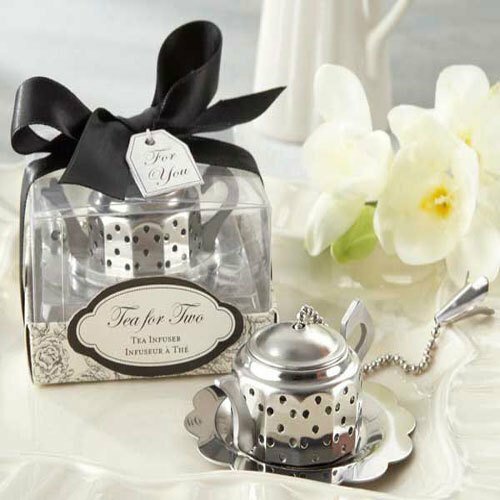 These jade-colored tea leaves brew a wonderfully sweet flavored tea with a delicate fragrance. This is a high quality tea that may be enjoyed at any time of the day. Buy your Longjing tea now! Longjing tea is a world full of history and elegance, a world you are welcome to explore. Take a journey to China with every tea cup you drink.